June 16 – After a three-week break, we’re back! Which means that, after several weeks of relative peace and quiet, the world has resumed it’s march toward World War III. There are two theaters where the action has picked up significantly: Iraq, which had been at a steady low boil for some time, and Ukraine (naturally). Afghanistan is as quiet as a country can be which has been at war for going on thirteen years. Action in Syria has picked up over the last few weeks–but not enough to get the Corporate Media writing about World War III breaking out in that Middle Eastern country as it was doing only months ago. ALL THE WORLD’S A STAGE for the USA and it’s minions (including whatever the commentators are calling al-Qaeda this week) versus Russia and its dupes. 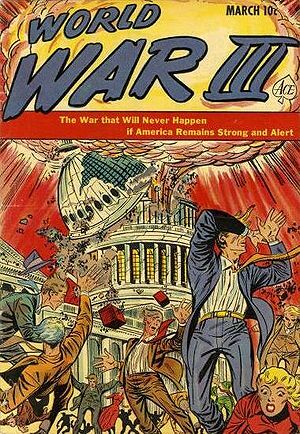 After a complete disappearance of the terms “World War 3” and “World War III” for over two weeks, both phrases have re-entered the headlines. Asia continues to be uneasy with Japan, China, the USA, Philippines, North and South Korea, Vietnam and a few others trading mostly insults. One suspects that although the “Big One (World War 3) will begin quite suddenly, this is not it. Not yet anyway. World War 3: Russian Tanks invade Ukraine, Bombers Buzz US Coast…Or is that Russophobia Propaganda? Economic World War 3 Declared on the U.S. Dollar! Tensions in Ukraine have erupted back into the public view and consciousness. Iraq erupted with a sudden fury that smelled of an orchestrated event. The country is being reportedly overrun and the U.S. embassy is supposedly being evacuated. Like 9/11, one has wonder where the invincible U.S. Air Force is in all of the fighting. The AF has not lost control of Iraq’s skies and it still operates an unknown amount of bases in the country. So why are lines of enemy military vehicles being photographed and the pictures splashed across the world’s media? Doesn’t the Air Force know where those long lines of vehicles are? They should ask a few of the photographers–they most apparently do. With fighting resuming in both Ukraine and Iraq, there’s a 34% chance of World War III; which is UP 5%. It may have gone up further, but there a sense that the USA, under the direction of Barack Obama is supposed to suffer some severe foreign policy setbacks prior to the 2016 American elections. Watchers may want to keep an eye out for that. Is this the beginning of the events which will make Americans hunger for a strong leader in 2016? A continued chance of a domestic terror attack [+60%] leading to war in the Middle East before October 2016. Some sporadic activity in Africa. The Middle East and North Africa remain a tinderbox awaiting a spark. Syria – up slightly with sporadic activity relating to actions in Iraq. Russia – up, with continued interest in Ukraine. USA – UP sharply, with Iraq taking center stage and Russian bombers off the California coast occurring this past week. Iran – down with hints the USA and ISIS-al-Qaeda using Iran as an intermediary. NATO (New) – down due to not paying much attention to world events other than global warming. Iraq is in full-blown melt-down. Expect a melt-down reflecting badly on Barack Obama’s handling of the Iraqi situation. The ultimate loss of Iraq could occur in stages, which will string along any Americans still emotionally invested in that theater of war. A protracted loss will also give the media a chance to thoroughly butcher Obama. Headlines like “Obama lost Iraq” will make Americans very eager for the “strong leader” who will lead them into foreign adventures–especially against the Muslim Middle East. SPECULATION: Look for something big in 2015 leading to something bigger in 2016 with full-blown World War by 2017. Overall Tension Assessment: Iraq and Ukraine lead the way back to discussion of World War 3 and its timing. Unless massive violence breaks out elsewhere, all will have to take a backseat to Ukraine and Iraq. Expect Syria and Iran to be drawn into Iraq. Expect the same media speculation of future events in Finland and the Baltic States to increase as events escalate in Ukraine. Obama Is Giving The Middle East To Al-Qaeda!